Where some see scraps, others see art! In Junk Art, let your creativity take over so that any scrap metal you touch turns into a beautiful structure. But you are not the only artist in town and you will have to stand out by showing off your talents and winning the hearts of new fans! Build your international reputation using more than 60 beautifully colored plastic pieces to create the most unique and wonderful Junk Ark structures available! How can this cylinder fit here? Will this sphere hold up? You have all the curves and flat surfaces you need to explore your creativity! Create anywhere around the world with 12 game modes! Have you ever visited Tokyo? Paris? Monaco? 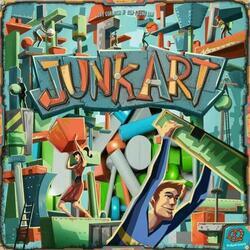 Junk Art invites you to travel the world to conquer 12 very different cities, each of them offering you a new game mode to discover, new talents to master. Conquer the most popular exhibitions! Each of the art galleries you covet will offer you unique challenges that will put a strain on your logic, your skill and... the balance of your artwork! Made of all different wooden parts, they will only stand up thanks to your dexterity. Some exhibitions will ask you to exchange pieces with competitors, to their great misfortune, others to create a work as soon as possible. A construction game that mixes skill, risk taking and a bit of strategy for a maximum atmosphere! Contents of the box : 6 plastic bases, 50 Fan tokens, 60 plastic pieces, 60 Junk Art cards, 15 city cards (including 3 blank cards), 1 First Player/Sense of the Game card, 1 Special card, 3 Cactus cards.